Autumn leaves rot down to make leafmould – a pleasant, darkbrown, crumbly material. 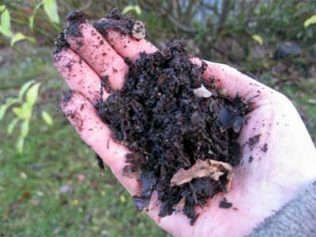 Leafmould is a good soil improver,lawn conditioner and mulch. It can be used in seed and potting mixes too. Small amounts of autumn leaves can be added to your compost heap. They make a good balancing ingredient for wet and soggy materials like grass mowings and kitchen waste. Autumn leaves are rotted down mainly by the slow, cool action of fungi – rather than the quicker acting bacteria that are responsible for composting. This is why autumn leaves in greater quantity are best recycled separately in a leafmould heap. Collect fallen leaves from your garden, and from pavements and verges of quiet streets. Don’t use leaves from busy roads, which may contain unwanted contaminants. Leaves can be gathered up by hand, using a lawn rake. For larger quantities, leaf hoovers are available, some of which will also shred the leaves, speeding up decay. Or run the mower over leaves on the lawn with the grass box on. Add the chopped up mown leaves and grass to a leafmould heap. They will be quicker to rot than whole leaves. All that you need is a secluded corner of the garden, or a simple container, to stop the leaves blowing away. Black plastic bags can be used. When full of leaves, make a few holes in the bag with a fork and tie the top loosely. Buy, or make, a simple container made from plastic or wire netting with a few supporting stakes. Adjust the size to suit your requirements. New leafmould - 1 or 2 years old, depending on tree species. Leaves beginning to break up; easily crumbled in the hand. Well rotted leafmould - 2 years old in most cases. Dark brown crumbly material, with no real trace of original leaves visible. Don.t disturb drifts of autumn leaves under hedges and other out of the way areas. They may be used as hibernating sites by hedgehogs and other creatures.